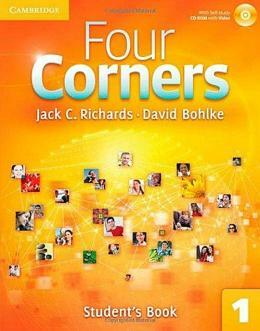 Four Corners is an integrated four-skills English course for adults and young adults. Four Corners Student´s Book with Self-study CD-ROM, Level 1 is designed for true beginning students requiring a thorough presentation of basic grammar, vocabulary,and functional language. The twelve units cover high-interest topics such as daily life, work and play, food, experiences, and celebrations. In Four Corners, multiple speaking activities in every lesson tied to measurable outcomes help students and teachers see the results of their learning. Additional ´Keep Talking´ activities help students develop fluency. As with other levels of Four Corners, an extensive set of print and electronic course components is available to help develop students´ communication and confidence.